We’ve had some unseasonably warm temperatures here in east Tennessee lately and it seems to have kicked off the shedding season. Cash is the shaggiest horse we have and the poor thing is itching all over because of it. He’s scratching on trees, fence posts, stall doors and even humans. We spent some time brushing him the other day and practically made another horse! I will have to take some pictures of what he does when being scratched. There are a few spots that turn him to butter. You have to watch him because it looks like he’s about to fall over on you while in his scratching trance. I brushed him gently and then watched as he bit himself and tugged at his hide to take care of an itch. I don’t think I’m brushing too hard. 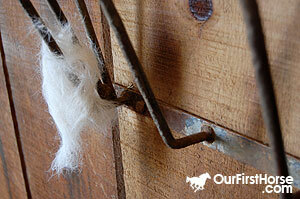 What seems to work well is this glove brush we bought at a tack auction last year. It’s rubber with little nubs on it and it’s just perfect for brushing a shedding horse. It’s not too tough to rub the face, neck and belly with, too. The other horses got a brushing but they are no where near as shaggy as poor Cash. Has the shedding season started at your place?